Over the past 30 years, “Jedinstvo” has implemented works on the most important construction projects in Russia, while it has been engaged in the largest infrastructure projects in Montenegro, Serbia and Srpska Republic for the last 10 years and no major state project in Serbia can even be imagined without it. The core activity of your company, which was founded way back in 1947, is the design and implementation of hydro, thermal and gas installations. What does your service encompass today? – MPP Jedinstvo Sevojno is an open joint stock company with an enviable business tradition dating all the way back to 1947. 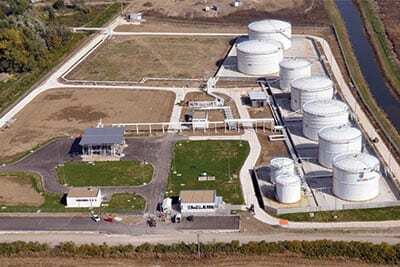 We’ve spent more than 70 years as one of the leading companies in the field of hydrotechnics, water management, gasification, installations of heating and drinking water supply systems, industrial wastewater management, the construction of external installations, all kinds of construction works and steel structures, which testifies to responsible and professional work. Given that Jedinstvo is also the majority owner of companies Novi Pazar Put [roads], Jedinstvo – Metalogradnje A.D. (JSC) Sevojno [steel structures], Užice-gas A.D. (JSC) [gasification], Zlatibor-gas, Livnica Požega [foundry], and that the group’s other activities have been extended to include road construction, gas distribution, iron casting, vehicle maintenance and repair, we manage to realise a total consolidated annual turnover of around 80 million euros. You’ve been present on the territories of the countries of the former USSR since 1988, while your engagement on the Russian market have been growing in recent years. Considering that it’s a huge country, are the jobs also big? – Over the past 30 years of operating on the Russian market, Jedinstvo has implemented works on the most important structures in Russia, such as the Central Bank of the Russian Federation in Moscow, the Krasnodar Regional Court, the residences of the Russian Patriarchate in Divnomorsk and President Putin in Valday. Jedinstvo also participated in the construction of almost all facilities for the needs of the Sochi Olympics. Over the last two years, with company Putevi Užice, we’ve carried out works on the Skolkovo Institute of Science and Technology in Moscow. Your company has invested more than 15 million euros of your own reserves over the last few years in order to purchase equipment, construct production facilities and purchase other companies… Do you plan further expansion? – The tendency of Jedinstvo for many years has been to invest two or three million euros each year, to ensure that we have the latest equipment for all types of activities from our branch. In addition to this, significant funds have been invested in the development of gasification activities in Užice and Sevojno (€6 million) and Zlatibor (€2 million). To what extent are you involved in the construction of capital infrastructure facilities in Serbia? Is the State a good investor? 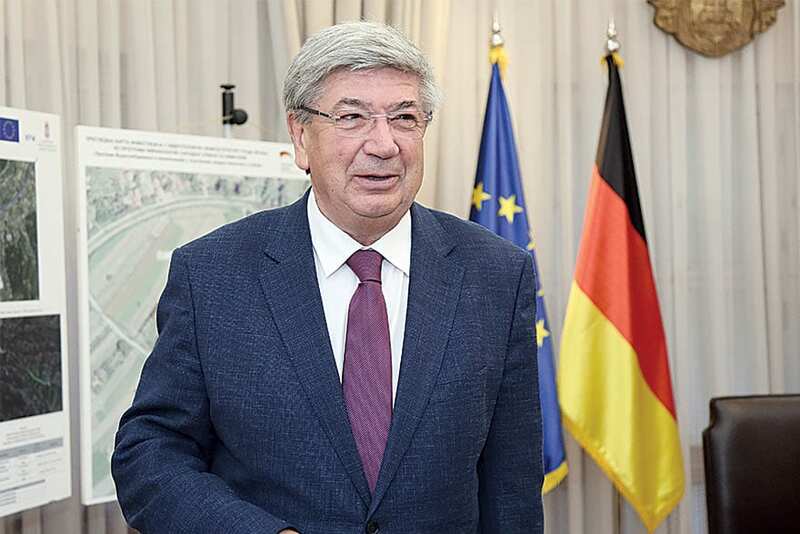 – Jedinstvo has always had good business cooperation with the government ministries for which it has carried out works on capital facilities in Serbia. The State was one of our largest investors in 2018 and 2019, with facilities such as the Water Factory in Užice and the construction of water supply systems and plants in Vranje, Pirot, Kruševac, Aranđelovac, Zlatibor and Kopaonik. Your company was extremely successful last year. What do you have to thank for that? – The fact that we are ready to implement the most complex undertakings in the field of construction, that we have the speed to realise any job, and an exceptional managerial team and employees, represents the basis of the company’s success. The most important project we’re currently working on, with our consortium partner MHPS from Japan, is the flue gas desulfurisation facility at the Nikola Tesla Thermal Power Plant in Obrenovac, the contracted value of which is 95 million euros. Together with company SMB construction, we are working on the Zvezdara shopping centre and the new building of RTV Vojvodina, while on Mount Zlatibor we’re engaged in the construction of a cable car system and a waste water treatment plant. You employ between 800 and 1000 workers. Do you have enough expert, qualified and motivated workers? – Within the composition of the company are multiple subsidiary enterprises that have more than a thousand permanent employees and 350 workers on temporary contracts, and it is thanks to this that we are able to carry out the most complex operational undertakings. The greatest attention is paid to the continuous training of employees, investments in their standards, high-quality conditions for their accommodation, food and transportation. We pay jubilee awards [bonuses for time served], solidarity assistance, scholarships for employees’ children and recruits, while salaries and shareholder dividends are paid without a single day’s delay. Considering all of this, I believe the motivation exists for our workers to achieve top results and that’s the key precondition for the success of our company. Investing in personnel has been, and remains, our basic commitment. You recently also conquered the Montenegrin market, where you’re building a water factory on Lake Skadar that’s worth 17 million euros. On the basis of this project, can you rely on the awarding of other works on the Montenegrin coast? 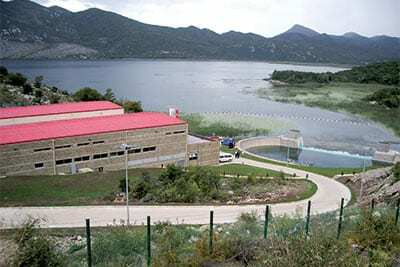 – We’ve been present on the Montenegrin coast for more than 10 years and have to date carried out works on the following facilities: the Mojdež plant in Herceg Novi, the water factory on Lake Skadar, with a capacity of 2,000l/s, for supplying the entire Montenegrin coast, and rehabilitation of the Budva-Tivat-Kotor regional water supply system. 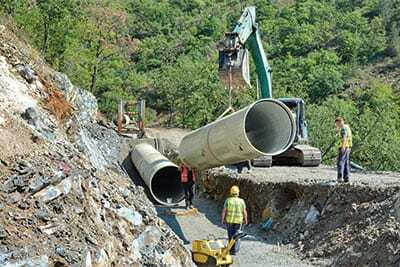 The high quality of implemented works has also secured engagements for us in the current period, with construction of the water supply and sewage system in Bar and the water supply project for Kotor, Tivat and Cetinje.